I wanted to update those who follow the happenings at YMCA of the Pines on a large project that we undertook over a year and a half ago that came to fruition this past August. As an organization, we have a duty not only to the thousands of campers and families whom we serve each year, but also to the grounds upon which our organization sits. As you know, YMCA of the Pines’ physical location sits upon 800 acres of forest in Medford and Shamong Townships here in Burlington County, New Jersey. In order to ensure that we’re being good stewards of the property, we prepared and submitted a formal Forest Stewardship Plan, also known as a Forest Management Plan, which was approved by the New Jersey Department of Environmental Protection on August 31, 2018. In 2017, we began working with Robert (Bob) Williams, a certified forester with Pine Creek Forestry, LLC, to prepare a forest stewardship plan. Our forest at camp has not been formally managed in some time, and in 2012, we acquired additional acreage in Medford and Shamong Townships taking our total from approximately 535 acres to just over 800. However, we don’t have much history for that section of the property with respect to formal forest management. Controlled burns remove invasive, non-indigenous trees and vegetation (weeds) from the forest while allowing for indigenous trees and vegetation to grow instead. These are all important goals, as we want our forest to be healthy and vibrant to serve as the perfect backdrop for our camp and family programs, while also providing children and families with a natural, serene outdoor setting. We were fortunate to receive a grant from the US Department of Agriculture, Natural Resources Conservation Service (NRCS for short) to fund the cost of the stewardship plan, in part. The remainder of the cost was self-funded from our capital budget, as investing in the long-term management of our forest and property is certainly in our organization’s best interest. Our forester, Bob Williams, took many trips out to camp in 2017 and 2018 to hike various portions of the property to break it all down into various “stands”. Mr. Williams then detailed the types of trees that could be found in each “stand” of the property, and made specific recommendations for how the “stand” should be managed to best achieve the benefits laid out, above. The various “stands” were compiled into a map, and his recommendations turned into the bulk of the plan which was then submitted to the State for review and approval. 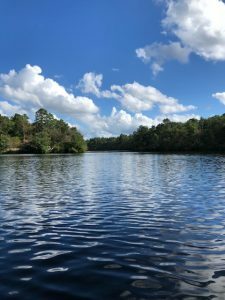 Mr. Williams put in a significant amount of work to produce the plan – as one can imagine, it is not easy to walk and catalog 800 acres of forest! Now that we have a stewardship plan that has been approved by the State of New Jersey, Department of Environmental Protection, we are able to take the thinning (cutting) and controlled burning steps detailed by Mr. Williams in the plan to manage our forest. These steps can be done over a 10-year period without applying for a permit or approval from the State, so long as we’re acting within accordance with the Plan. Of course we are not going to go out and start lighting fires around the property ourselves! Rather, we will work with the New Jersey Forest Fire Service to conduct a controlled (prescribed) burn of various sections (stands) of the property, as detailed in the Plan. The Forest Fire Service manages the burns to ensure that they’re done during optimal conditions, and in coordination with local (Medford Township) fire officials. These burns will be implemented over time, with a little bit being done each year so we’ll be able to effectively manage our 800 acres while providing an educational opportunity for children about how a prescribed burn affects a forest immediately afterwards, and in the years that follow. At YMCA of the Pines, we take our obligation to preserve this property in a pristine manner for generations to come very seriously, and we’re excited about the opportunity that we have to manage our forest over the next decade. Further, we are grateful to Bob Williams of Pine Creek Forestry, LLC for his work in compiling the plan, and working to ensure that it was approved by the State, and to Nicole Ciccaglione, the District Conservationist with the NRCS, for working with us to secure funding for the Plan. If you would like more information about YMCA of the Pines’ Forest Stewardship Plan, or if you would like to make a donation to help fund the costs of managing our forest, please contact me – (GregK@ycamp.org).